Detta är ett fast objektiv som tillverkats av Sigma och modellen lanserades 2012. Objektivet tillhör kategorin fasta teleobjektiv, där man saknar möjligheten att zooma in eller ut. Objektivet har macro-egenskaper och klarar av att återge saker i dess äkta storlek (1:1) vilket är bra; det brukar vara regeln för att det skall få kallas ett 'äkta' macro-objektiv. Objektivet finns för både Canon- och Nikon-kameror, men det är två olika versioner av objektivet så det är viktigt att du vid köp väljer den version som är anpassat för just ditt kameramärke. Detta objektiv är konstrukterat för att passa med alla modeller av Canon och Nikon-kameror, oavsett modell och sensortyp. Objektivet har en brännvidd på 180 mm. Beroende på vilken kamera objektivet används kommer den upplevda brännvidden att variera. Se därför gärna listan över kompatibla kameror nedan. Där visas också vilken motsvarande brännvidd du får på respektive kamera. Objektivets ljusstyrka och bländarvärde är f/2,8. Detta bländarvärde visar på att objektivet är väldigt ljusstarkt. Detta underlättar fotograferingar i mörkare miljöer där man inte vill eller kan använda blixt, t ex i kyrkor eller i idrottshallar. Ljusstarka objektiv med längre brännvidd, som detta, tenderar att vara populära för sport- och naturfotografer. Inuti objektivet finns en bildstabilisator, som hjälper dig att parera eventuella rörelser och skakningar. Detta är mycket positivt och kan hjälpa dig avsevärt i situationer där ljuset är bristfälligt. Objektivet har en traditionell filtergänga framtill på objektivet och måttet är 86 mm vilket också de filter du skall använda måste ha. Att ha ett UV-filter framtill på objektivet kan vara en billig försäkring, mot repor och andra oförutsedda händelser. Om du köper detta objektiv följer det med ett motljusskydd, vars modellbeteckning är "LH927-01 (+ adapter HA927-01)". Detta objektiv är utrustat med ett stativfäste, som underlättar användandet av stativ. Objektivet har ersatt en tidigare version och detta objektiv är just nu den nyaste utgåvan men jämför gärna med de tidigare versionerna innan köp. Text från Sigma: "Large aperture optically stabilised telephoto lens with life-size macro capability. The world’s first 180mm 1:1 macro lens with a fast, f/2.8 maximum aperture. This lens includes three FLD glass elements that have a performance equal to fluorite and ensure exceptional correction of axial chromatic aberration and lateral chromatic aberration. A floating inner focusing system moves two different lens groups in the optical path to different positions. This system compensates for astigmatism and distortion and provides extremely high optical performance from infinity to 1:1 macro. The overall length does not change during focusing, ensuring convenient handling. Metal parts are used in the lens barrel ensuring high durability of the body. This lens features three FLD (“F” Low Dispersion) glass elements, which have the performance equal to fluorite glass. FLD glass is the highest level low dispersion glass available with extremely high light transmission. This optical glass has a performance equal to fluorite glass which has a low refractive index and low dispersion compared to current optical glass. It also benefits from high anomalous dispersion. These characteristics give excellent correction for residual chromatic aberration (secondary spectrum) which cannot be corrected by ordinary optical glass and ensures high definition and high contrast images. The optics are coated with Sigma’s Super Multi-Layer Coating which reduces flare and ghosting and ensures high contrast images. High image quality is assured throughout the entire focusing range. This is the first 180mm optically stabilised telephoto macro lens in the world and offers effective correction of approximately 4 stops. The system compensates for camera shake even in the macro range photography where only a small amount of blur can be easily identified. * The OS effectiveness will gradually decrease as the shooting distance becomes shorter. .
Tele macro lenses have a greater working distance. It is possible to enjoy Macro photography, even when you are far from the subject. This enables you to capture the small animals and insects without disturbing them. The very narrow depth-of-field allows selective focusing and less distracting backgrounds. Large aperture of F2.8 also makes this lens ideal for sports, action and indoor photography. The HSM (Hyper Sonic Motor) ensures quiet and high speed autofocus as well as full-time manual focus capability. This lens has a rounded 9 blade diaphragm creating a smooth blur to the out of focus areas of the image. It is also possible to use this lens with Sigma’s optional APO Tele Converters. It is also possible to use this lens with Sigma 1.4x EX and 2x EX APO Tele-Converter. When this lens is used with the 1.4x EX or 2x EX Apo Tele Converters (optional), it becomes a 210mm F4 AF tele-macro lens or a 300mm F5.6 MF tele-macro lens respectively. As a flagship macro lens, uncompromising high rendering performance is achieved. Three FLD (“F” Low Dispersion) glass lenses that have a performance equal to fluorite ensure exceptional correction of axial chromatic aberration and lateral chromatic aberration. A floating inner focusing system moves two different lens groups in the optical path to different positions. This system compensates for astigmatism and distortion and provides extremely high optical performance from infinity to 1:1 macro. The overall length does not change during focusing, ensuring convenient handling. Metal parts are used in the lens barrel ensuring high durability of the body. * FLD glass is the highest level low dispersion glass available with extremely high light transmission. This optical glass has a performance equal to fluorite glass which has a low refractive index and low dispersion compared to current optical glass. It also benefits from high anomalous dispersion. These characteristics give excellent correction for residual chromatic aberration (secondary spectrum) which cannot be corrected by ordinary optical glass and ensures high definition and high contrast images. This is the first 180mm optically stabilized telephoto macro lens in the world and offers effective correction of approximately 4 stops. The system compensates for camera shake even in the macro range photography where only a small amount of blur can be easily identified. * The OS effectiveness will gradually decrease as the shooting distance becomes shorter. This is the first 180mm telephoto macro lens in the world with a reproduction ratio of 1:1 and a maximum aperture of F2.8. The narrow depth of field enables photographers to emphasize the subject and the large aperture provides a bright viewfinder image. Together with the OS function, they help the photographer confirm accurate focusing. In order to achieve high rendering on this flagship lens, flare and ghosting were thoroughly measured from an early stage to establish an optical design which is resistant to strong incident light such as backlight. The Super Multi-Layer Coating reduces flare and ghosting and provides sharp and high contrast images even in backlit conditions. The hood adapter extends the length of the lens hood and provides more effective shading to block out extraneous light which may have a harmful influence on the lens’s rendering performance. * When using the APS-C Hood Adapter HA780-01 with digital cameras with larger than APS-C size image sensor, vignetting will occur. Please remove the hood adapter if you are using these cameras. The lens incorporates HSM (Hyper Sonic Motor), ensuring high speed and quiet AF as we as full time manual focus capability. This lens incorporates a brass made bayonet mount which has both high accuracy and durability. A special treatment to reinforce its strength is applied to the surface giving it greater strength and making it highly resistant to long-term use. The rounded 9 blade diaphragm creates an attractive round blur to the out of focus areas of the image. The addition of Sigma´s 1.4x EX DG APO or 2x EX DG APO TELE CONVERTER produce a 252mm F4 AF telephoto macro lens* or a 360mm F5.6 MF telephoto macro lens respectively. Tele Converters can also be used to extend the maximum magnification ratio beyond 1:1. * AF can operate between infinity and 0.67m. A Removable tripod socket that makes it easy to exchange lenses, and a focus limiter that restricts the range of AF operation are incorporated for improved usability. 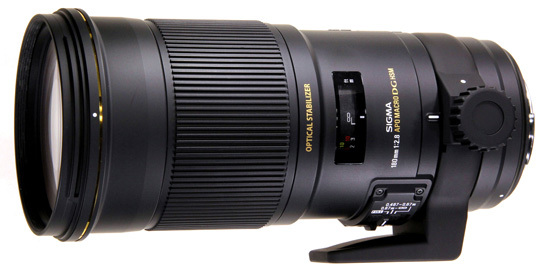 Sigma provides an excellent lineup of 5 macro lenses with a reproduction ratio of 1:1. The MACRO 50mm F2.8 EX DG, a standard macro, MACRO 70mm F2.8 EX DG, a medium telephoto macro, and MACRO 105mm F2.8 EX DG OS HSM which has Sigma’s original Optical Stabilizer function, as well as APO MACRO 150mm F2.8 EX DG OS HSM, a telephoto macro, to this APO MACRO 180mm F2.8 EX DG OS HSM. Standard macro is suitable for taking pictures of things like accessories by adjusting the position of the subjects by hand while still looking into a finder. Medium telephoto macro is suitable for taking pictures of flowers using natural lighting, and telephoto macro is suitable for taking pictures of highly sensitive subjects such as tiny insects with greater working distance. With the lineup, it is possible to select lenses according to subjects. This is the world´s first 180mm macro lens incorporating a magnification ratio of 1:1 and a large maximum aperture of F2.8. It benefits from Sigma´s original Optical Stabilizer function and the wide F2.8 aperture allows faster shutter speeds for narrow depth of field, enabling photographers to emphasize the subject. Three FLD (”F” Low Dispersion) glass elements provide excellent correction for color aberrations. This lens incorporates Sigma´s floating inner focusing system. This minimizes aberrations which occur as shooting distances change, and enables stable rendering of the image from infinity to 1:1 magnification. The Super Multi-Layer Coating reduces flare and ghosting and provides sharp and high contrast images even at the maximum aperture. Equipped with Sigma´s own propriety OS (Optical Stabilizer) system, this lens offers the use of shutter speeds approximately 4 stops slower than would otherwise be possible*, enabling handheld close-up photography. The incorporation of HSM (Hyper Sonic Motor) ensures quiet and high speed autofocus as well as full-time manual focus capability. This lens has a rounded 9 blade diaphragm creating an attractive blur to the out of focus areas of the image. At 1:1 magnification, this lens has a focusing distance of 47cm/18.5in, which is a greater working distance than shorter focal length macro lenses. This is advantageous when taking pictures of highly sensitive subjects such as butterflies and insects. Attaching Sigma’s optional Tele Converter´s allows photographers´ to shoot with an even greater working distance or with a magnification ratio larger than 1:1. "